Kiss Me Kill Me Out Now! How far would you go to escape the one you love? When Zoe meets Dan, he's everything she is looking for in a man - intelligent, charming, supportive. It's only after they're married that she realises that he's controlling, aggressive, paranoid. And there's no way out. Zoe knows she has to escape, but Dan's found her once before, and she knows he can find her again. But Dan has plans of his own. Plans that don't necessarily include Zoe. Click here to get a copy from Amazon. We are thrilled to announce that THE KILLING GAME has been shortlisted for the Ian Fleming Steel Dagger. James said, "This is such a huge honour. Even just making the shortlist is a major achievement. I am absolutely blown away to be included in this list of amazing writers." The winner will be announced at the Crime Writer's Association Gala dinner in October. Bonnier will be publishing James's next two standalone novels. 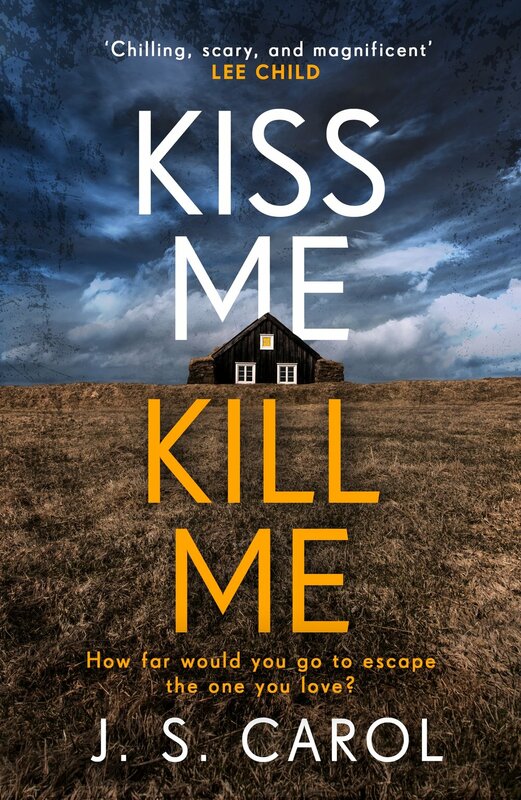 KISS ME KILL ME, the first of these will be out in February 2018. The deal reunites James with Katherine Armstrong, his former publisher at Faber & Faber. James said: "It’s amazing to be working with Katherine again. Under her keen editorial eye the Winter books went from strength to strength, and I can’t wait to start working on the standalones with her. It’s going to be great getting these stories out to readers, and the fact that a company with the enthusiasm, passion and expertise of Bonnier Zaffre will be publishing them really is the icing on the cake." And Katherine added: "I am thrilled to be working with James again and to bring his fantastic new psychological thriller to readers. He is a natural storyteller and this thriller whips along at breakneck speed. Just when you think you’ve worked out the plot, James throws in a twist that has you going in another direction. This really is a fast-paced and fun read and I can’t wait to introduce readers to Zoe, Dan and a superbly dark ending that they will love." Everyone thinks her husband is responsible, but former FBI profiler Jefferson Winter isn't so sure. The method is too perfect; the lack of mistakes, uncanny. He's seen a series of carefully orchestrated murders - once a year, on exactly the same day, a woman dies in a situation just like this one. The Killing Game blows the critics away! Of course, you can make your own mind up by grabbing a copy today! For Hollywood media agent J.J. Johnson, a run-of-the-mill business lunch turns into a nightmare when a masked man wearing a bomb vest comes crashing through the restaurant doors. But this is no terrorist attack. As the body count rises, it becomes clear that the bomber has his own agenda. But what has driven him to take such extreme measures? The bomber isn't the only one with secrets. J.J. has her own secrets too. Has the past finally caught up with her? As events unfold, she is forced to confront her own history and see how decisions made years ago have finally returned to haunt her. Set in Los Angeles, and written in real-time over 3½ hours, THE KILLING GAME explores what happens when the A-list are faced with a scenario they should only ever see in the movies. On July 16th James appeared at the Semana Negra festival in Gijón Spain to talk about Muñecas Rotas (Broken Dolls). The festival is now in its nineteenth year, and is the largest in Spain. For a whole week the old dockyard area of the city is taken over, with thousands of visitors attending every day. The attractions include a fairground, live music and dozens of stalls. James shared the stage with Diego Garcia and Conde and Sol Pombe, two artists from Argentina. While he was being interviewed, they painted their interpretation of Broken Dolls. The publication of PREY was marked with a launch at Watersrtones in Trafalgar Square. Joining James for the event was Paul E Hardisty, whose debut novel, The Abrupt Physics Of Dying, was released on the same day. After the speeches, Paul and James were joined on stage by William Ryan, the creator of the Captain Korolov books, for a panel discussion. The real star of the show, however, was definitely the cake! James said, ''It's only been fourteen months since Broken Dolls was published and here we are on book 3 already. The last year has been a complete whirlwind, but the highlight has been seeing how warmly Jefferson Winter has been received by readers." Over the weekend of 8th November, James attended the prestigious Mord Am Hellweg Crime Festival in Germany. He and Benjamin Fürmann (German film and TV star) read from BROKEN DOLLS, bringing Jefferson Winter to life for the German fans. James also participated in Q&A sessions, chatted to his readers and signed books. Mord am Hellweg started in 2002 and is now Europe’s largest Crime festival. Featuring international names such as Karin Slaughter, Mark Billingham, Arne Dahl and Jo Nesbo, it runs biennially and takes place in the Hellweg Börde, part of the North Rhine-Westphalia, region of Germany. One of the festival's charms is that the events take place in unusual locations such as old churches, ruins and industrial monuments. James's was at Castle Horst in Gelsenkirchen. The German edition of BROKEN DOLLS is available from Amazon. Hush Little Baby On Sale Now! Hush Little Baby, the second installment of the Jefferson Winter Chronicles, is on sale now. FBI profiler Yoko Tanaka is in Tampa, Florida helping the local PD with their 'Sandman' case. Three mothers and their daughters have been found murdered in their homes. The mothers have been brutally stabbed while the little girls' have been smothered in their beds and posed to look like they're sleeping. Defying FBI protocol, Yoko makes a detour to Sarasota to entice Jefferson Winter to join the case. Winter has now graduated from college and is playing piano in a tourist bar. At first he's reluctant to get involved but that's the thing with Winter, what he says and what he means are usually two different things. All Yoko knows is that he's the only person who can help her before the Sandman claims another two victims . . . but what Winter doesn't know is that Yoko might be the only person who can help him come to terms with his past. James will be appearing on ITV3's The Crime Thriller Club on Monday September 22 at 9pm to talk about WATCH ME. The episode will also feature reviews of the book by some of the genre's top writers. The show is being repeated on Thursday September 25 at 12.05am. 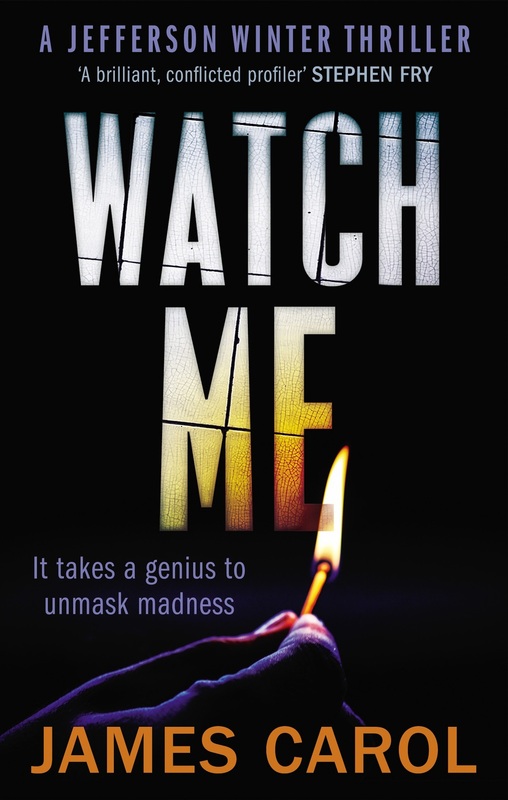 WATCH ME has made the shortlist for the Specsavers Crime Thriller Book Club Award. The winner will be announced at a glittering gala dinner, which is being held at the Grosvenor Park Lane Hotel on Friday, October 24th. James will be appearing on ITV3 on Monday, September 22nd at 9pm to talk about the book. With five women already dead, time is running out for the police t'o catch the killer before he strikes again. Within twenty-four hours of Yoko's arrival they have a suspect in custody: a precocious nineteen-year-old kid called Jefferson Winter whose IQ is off the charts. He's also a textbook psychopath and the son of one of America's most notorious serial killers. Not only does he confess to the murders, he knows details of the crimes that only the killer could know. It's an open and shut case, or is it? Sales of BROKEN DOLLS have now exceeded the 100,000 mark. Because demand for more Jefferson Winter stories has been so high, publication of WATCH ME has been brought forward to August 15th, and PRESUMED GUILTY will be available from the beginning of July. James will be appearing on two Sunday morning panels at this year's Crimefest. At 9.30 he will be joining Emma Kavanagh, Neil Broadfoot, Rebecca Muddiman and Charlotte Williams for Debut Authors: An Infusion Of Fresh Blood. The panel will be moderated by Laura Wilson. And at 11.50 he will be appearing alongside Declan Burke, Mick Herron and Kerry Wilkinson for Investigators: Private & Not So Private. This panel will be moderated by Ruth Downie. Broken Dolls has reached number 1 on Amazon's Kindle Fiction chart and the iBook Crime and Thriller chart. It is also a Top 3 bestseller in Italy, reaching number 3 in the Italian Kindle chart. PRESUMED GUILTY, the first installment in a series of eBooks set during Winter's FBI days will be released in July. While WATCH ME, the second full-length novel, will be published in September. For more information click here. The One That (Almost) Got Away - James talks to Crime Time about how Broken Dolls came about. Female First - An exclusive interview with James on all things TV and JW. On The Side Of The Angels - James talks to Shotsmag about antiheroes and Jefferson Winter. Broken Dolls, the first Jefferson Winter thriller, is now on sale! To date, Broken Dolls has sold to five countries: Germany, the Netherlands, Italy, Thailand and Turkey. TV and film rights have been optioned by Sprout Pictures, the production company owned by Stephen Fry and Gina Carter. To order your copy from Amazon click on the cover. Television rights for Broken Dolls have been optioned by Sprout Pictures, the production company behind the Emmy award winning SKY comedy Moone Boy. The company is planning to adapt the novel into a major TV series, provisionally titled WINTER. Sprout Pictures is jointly owned by Stephen Fry and Gina Carter, and, since its inception in 2004, it has built up an enviable reputation. Over the years, the company has worked with some of the most sought after names from stage and screen, including Emma Thompson, Richard E Grant, Idris Elba and Anna Friel. Amongst its many successes is the hit ITV series Kingdom, which starred Stephen in the title role. James and William Hope at the recording of Broken Dolls. Last week James was at White House Sound Studios in Syston, Leicestershire, for the recording of the audio book version of Broken Dolls. The book features the vocal talents of William Hope and Julia Barrie, and will be on sale next year. During his visit, James recorded an interview with William, which will be included on a bonus CD. An excerpt will be posted here as soon as it is available. Enter your email address and name to receive the Jefferson Winter newsletter.